This coming week is Carers Week, 6th - 12th June. A week of recognition and celebration of the role of a carer. The carers we are talking about are those who are not employed as a care assistant but those who care for a friend or family member on a regular, short term or full time basis. According to Carers Week there are 6.5 million unpaid carers in the UK. I've mentioned previously that my Mum has become my Grandad's main carer since we lost my Nan and wrote about a weekend I stayed with him here. 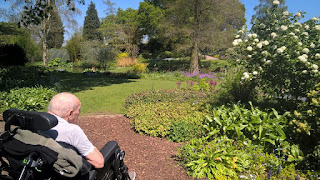 I thought I would take the opportunity to write a post about my families experiences and how they relate to the Carers Week Campaign, Building Carer Friendly Communities. First of all I watched my Nan leave the house less and less as my Grandad's mobility decreased and she found it harder to move him around. She never once conveyed frustration or resentment around this. It frustrated the hell out of me knowing that there was help and support available but on the surface she appeared too stubborn to ask for or accept it. I think the real reason was fear. Fear of what might happen if a social worker came in, fear of care assistants coming in at various times of the day. She was afraid of other people coming into her home and taking over. Taking care of the house and Grandad had been her role for many years. Having some experience working in the care sector I tried to reassure her that that wouldn't happen, that she could still be involved and that we could find someone both her and my Grandad liked and felt comfortable with. No amount of reassurance worked and she struggled on. My Mum accepts some help, we requested an assessment and some adapted equipment. We also receive an allowance to pay a carer to provide care within his home. We have Grandad's carer come in for part of the day during the week. The other part of the day and weekends my Mum provides the care. My Sister, Cousin and I help when we can, usually evenings and weekends so that my parents can go out and maintain some of their social life and some time away from caring. Don't get me wrong, my family do not see the role of carer as a burden in any way and I really appreciate the opportunity it has given me to spend more one on one time with Grandad. Having said that it can be hard. Hard in the sense that you have someone who is dependent on you, someone you are responsible for. We went through quite a long spell last year where we were constantly on edge due to his health, always wondering when he might get another infection, will the effect be worse than the time before, will he be able to fight it off like he did before? The role can also be restrictive, yes we now have the van and an adapted wheelchair which does make things a lot easier in one way but harder in another. The wheelchair is bigger and heavier so hills and small spaces are difficult, pushing him on anything that is not tarmac/concrete can also be difficult, steps and stairs are a definite no. This gives us a few things to think about before we head out for the day. What does a carer friendly community mean to me? I can only comment on what I feel would be helpful from my experiences. For me, I think work needs to be done to provide people with information about where to go to ask for help but also that there is no shame in asking. You are not failing, you are not passing your duty or responsibility onto someone else. You are simply asking for someone to work alongside you to support both yourself and the person you care for. If I hadn't have known where to go to request an assessment, my family would have been stumbling around in the dark. I do not believe anyone at the hospital asked about our situation when my Nan was taken ill, no support or information offered. I also feel that companies that provide care need to offer more flexible times, we found it really difficult to find a company who could offer a block of care longer than 2 hours. What realistically can you achieve in 2 hours? Especially when it takes a good 20 minutes to drive to the nearest town. Finally, accessibility can be a real issue. I'm not sure what the answer to this problem is, I'm aware that it is not always easy to make alterations to existing buildings or open spaces and that doing so can be expensive. However, on the flip side of that, my Grandad is still a person and deserves to access and enjoy being out in the community and we as a family need to be able to go out and about and take him with us. We all need and deserve a good quality of life, not a restrictive one. Although, I think we are making progress as a society, I believe there is still a long way to go. If you want to have a look at ways you can help, hop over to the Carers Week website. They have a checklist to help you think about whether your local community is a carer friendly one and how you can help improve it through providing information to others. What are your thoughts on caring and carer friendly communities?